The Complicated Legacy of the Mad Scientist « Nothing in Biology Makes Sense! When I was around ten years old, I dressed up as a mad scientist for Halloween. I wore coke-bottle glasses and a lab coat splattered with a mysterious green substance. I carried a (fake) lab rat in my pocket, along with test tubes full of brightly colored solutions. And my mom did my hair, using a comb and A LOT of white hairspray to give me a look that I hoped was reminiscent of Doc Brown (but that probably looked more like Beetlejuice). I have been fascinated by the mad scientist for as long as I can remember. Growing up, my favorite television shows included Pinky and the Brain, Beakman’s World, and Mystery Science Theater 3000. I loved Back to the Future, and I watched Batman Forever over and over again to see Jim Carrey play Edward Nygma. Once I got a little older, I was able to appreciate some of the more sinister mad scientists in cinematic and literary history; characters like Dr. Moreau, Dr. Seth Brundle, and, of course, Dr. Victor Frankenstein. The mad scientists of movies and books helped to nurture my interest in the natural world, capturing my imagination in ways that the standard, garden-variety scientist sometimes did not. Though an important and positive part of my childhood, the legacy of the mad scientist is actually quite complicated. The mad scientist archetype has grown out of society’s simultaneous fascination with, and fear of, scientific discovery, and thus it has had both positive and negative effects on the public perception of science. One great thing about mad scientists as fictional characters is that they help keep the public engaged in science. Science is commonly perceived as boring. Scientists are generally thought of as generic and unsmiling (even by scientists themselves!) and science is seen as a mind-numbingly mundane process. Mad scientists, in contrast, are anything but boring. The mad scientist is an engaging character that tends to shake things up- when a mad scientist is on the scene, you know things are about to get interesting (and probably a little bit weird, too). Another positive of mad scientists is that they help to dispel the myth that science is not creative. Science is often viewed as the antithesis of art: people who are good at science aren’t creative, and people who are creative can’t hack it at science. This misconception is particularly frustrating given that successful science actually requires a good deal of ingenuity and innovation. Mad scientists aren’t afraid to think outside the box- in fact, this is one of the hallmarks of their madness. They push the boundaries of scientific discovery, with sometimes spectacular, and sometimes disastrous, results. The mad scientist has also done a fair amount to negatively impact the public perception of science. In fact, some of the most common misconceptions surrounding present-day scientists share apparent connections with the mad scientist archetype. For instance, even the most benign mad scientists in fiction are often portrayed as zany and peculiar. Their laboratories are full of ridiculous rube goldberg-esque inventions, and they spend time developing elaborate and impractical schemes to solve trivial problems. Characters with these qualities include Back to the Future’s Doc Brown and Futurama’s Professor Farnsworth. At first glance, this trope may seem fairly harmless to scientists in the real world. However, politicians like Representative Lamar Smith routinely rely on this trope to argue against government support of academic research, citing seemingly obscure-sounding NSF-funded projects in order to make scientists sound eccentric and irresponsible. Another common characteristic of mad scientists is that they are doing mad science for some kind of personal gain. Alchemists in 15th century fiction were commonly depicted as being motivated by greed, while comic super villains such as Lex Luthor and Doctor Doom are often in pursuit of power and control. And in this summer’s Jurrasic World, Dr. Wu got the mad scientist treatment when we found out he was creating genetically enhanced super-dinos for the US military, for profit. In the real world, this trope is particularly relevant to the climate change debate. Climate change deniers, seeking to undermine experts in the field, often argue that the researchers have fabricated results in order to increase job security and funding. Finally, mad scientists in books and movies are frequently portrayed as having a corruptive influence on society. The scientist’s research is itself in direct conflict with morality, resulting in harm to the scientist and those around him. For example, Dr. Victor Frankenstein, Nathan from Ex Machina, and the creator of the Replicants in Blade Runner are all scientists that pursued taboo work, with disturbing results. In the real world, some of the most direct effects of this trope can be seen in the field of evolutionary biology. Evolutionary theory is thought by many to encourage immoral behavior, and this viewpoint is common enough that it continues to affect science education in schools throughout the US. Mad scientists are exciting and creative. They are also often eccentric, greedy, and morally misguided. The mad scientist’s ambiguity is one of the things that makes him such a compelling character, but the negative characteristics of fictional scientists can have very real consequences for scientists and science educators. Today, we are entering a new age in the world of the mad scientist. My proof? Princess Bubblegum, of the animated television series Adventure Time. Princess Bubblegum is a fantastically unique and incredibly interesting character. She isn’t your typical mad scientist- she’s a she, for starters, and she’s a princess! She’s smart, curious, and morally ambiguous. Her science often falls more on the “mad” side of the spectrum. For instance, in an experiment gone wrong she created the Earl of Lemongrab, a lemon-headed creature who terrorizes and cannibalizes the inhabitants of his earldom. So yeah, definitely some mad science going on there. 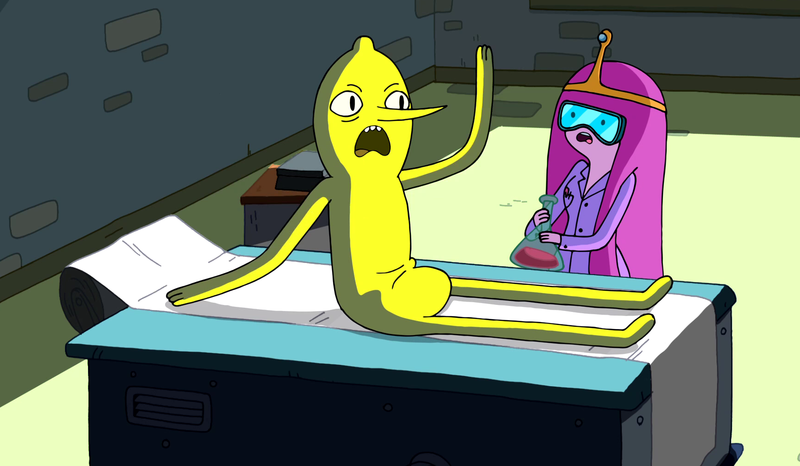 Princess Bubblegum introduces some diversity into the incredibly one-dimensional world of the mad scientist. And her arrival on the mad scientist scene comes at a time when our perception of scientists in the real world is experiencing an overhaul as well. Historically, we as a society have had a very narrow definition of what it means to be a scientist. Scientists have traditionally been pictured as straight white males, and also as “lone geniuses”- socially isolated, naturally gifted individuals that exhibit a dedication to their work that borders on obsession. In other words, what we commonly think of as the “ideal” scientist is essentially just the archetypal mad scientist, minus the bad hair day. Really, is it any surprise that the line between scientist and mad scientist can sometimes seem so blurry? Fortunately, we are beginning to move away from this one-dimensional view of what makes a scientist a scientist. Thanks to recent campaigns highlighting diversity in STEM fields, greater recognition that scientific progress tends to be collaborative in nature (rather than the work of a single “genius”), and a push to address the shockingly pervasive “culture of acceptance” surrounding mental health problems in academia, we are closer than ever to dispelling the myth that only certain people belong in the sciences. As we continue to achieve greater levels of diversity in the sciences, I hope that we also continue to broaden our horizons with depictions of mad scientists in fiction. And as the motivations, backstories, and personality traits of these characters become more varied, the outdated tropes of the archetypal mad scientist will inform our perceptions of real scientists less and less. So here’s looking forward to mad scientists that shake things up, that break the mold, that play by their own rules push the boundaries of what we already know. Because, really, isn’t that what the mad scientist is all about? And in honor of the upcoming holiday, please check out our compilation of some of the greatest mad scientists in cinematic history. Happy Halloween! This entry was posted in communication, evolution in culture and tagged mad scientists.